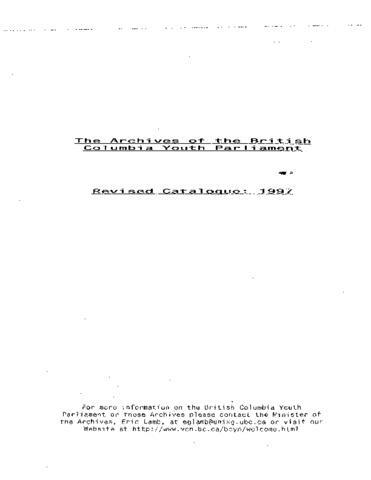 The British Columbia Youth Parliament was known as the Older Boy's Parliament from its date of incorporation (1924) until the 1974 session at which time the present name was adopted. The fonds consists of the records of the B.C. Youth Parliament dating from its first session in 1924. It includes journals of the House, correspondence relating to sessions and group activities, membership lists, reports, press clippings, press releases, records relating to playground development in urban housing complexes, records reflecting the administration and operations of the Parliament, and photographs. Fonds was received in three accruals. Additional information about the first two accruals is available in the attached PDF document. Box 8A contains slides and negatives of various sessions/events and a dominoes game set.